Stephanie’s blog made me hungry. I made myself nuts by not having an precise recipe. A couple of divers made a website that helped me out. The result is lip-smackingly delicious — sweet, tart, acidic, smoky and all-around fabulous. Sop up all the extra balsamic and chorizo oil that finds its way to the bottom of the plate with a slice of good, crusty bread. 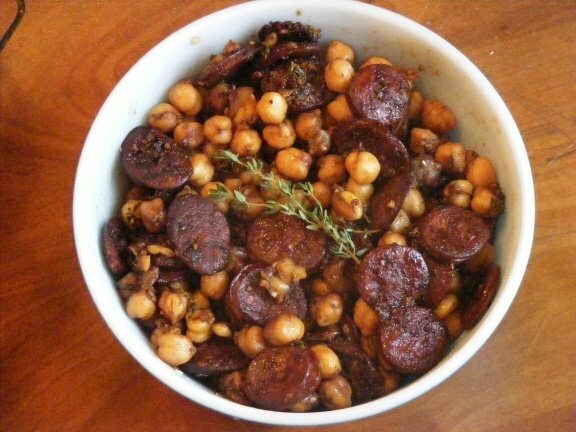 In a small bowl, toss thyme, balsamic, oil, garlic, salt and pepper with the drained chickpeas; set aside. Heat a frying pan over medium heat, add the chorizo and cook for 2-3 mins. Add the chickpea mixture and cook for a further 2-3 mins until chickpeas are warmed through. Enjoy!